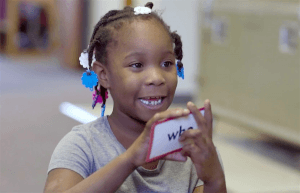 A Bloomington Boys & Girls Club member practices with flash cards. Bloomington, Ind. – April marked the first anniversary of Cook’s tutoring program in partnership with Bloomington’s Crestmont Boys & Girls Club. Over the past year, 30 Cook employees have volunteered more than 1,300 hours tutoring kids ages 6 to 17. The program consists of Cook employees that volunteer to tutor students in grades K-12 at the Crestmont Boys & Girls Club. Cook employees are excused early from work twice a week to attend tutoring sessions throughout the school year. During these sessions, students receive one-on-one help with their homework and tutoring support in all subject areas. The Boys & Girls Clubs of Bloomington purchased a new building for the Crestmont Club, with renovations scheduled to be complete for the 2017-18 school year. This new building will expand the Crestmont Club from 40 to 180 students being served daily. Cook is already looking ahead to recruit another 20 employees into its tutoring program to help meet needs for the next school year. Aaryn Eady, program director of the Crestmont Boys & Girls Club, discusses her experience with the Cook tutoring program in the video below.